Let me preface this by saying I hate the Colts. I hate Peyton Manning. I hate Bill Polian. I hate Bob Sanders. I hate Indianapolis fans. I am a diehard Patriot fan and I hate everything about the Colts. That being said, I actually feel bad for the players and their fans this morning. Jim Caldwell and Polian single-handedly destroyed their chance at history yesterday. How many teams in the history of sports (any sport) has a chance to go undefeated? You are talking about the chance to go down as the single greatest team in NFL history. Until another team goes 19-0, there is no dispute, if the Colts had done it this year they would have been considered the greatest. I just don’t understand the logic of this decision. They play the starters until the middle of the 3rd quarter, lead by 5 points, and then decide to call it quits. Whaaat?? The game was 65% over and they decide at that point to give up? Whaaat?? What must the Colts players think today? I know they said the right things to the media after the game but what must they be saying in that locker room? If I were one of them, I would be furious. 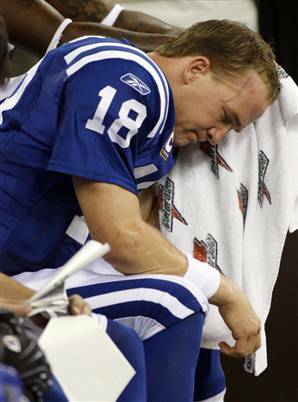 Most professional athletes, especially all-time greats like Manning, play the game and hope to leave a legacy. He had the chance to go down as the best quarterback ever who also lead the best team ever to an undefeated season. He had that chance taken away from him by his coach on Sunday evening. All that being said, I still don’t think they will end up winning the Super Bowl – regardless of if they had gone 16-0 or not. They are a flawed team that has squeaked by too many times this year. It is just too bad they didn’t even have the chance to lose a game with pride. Instead, they just laid down and gave up. That is a cowardly move, in my opinion. Finally, I was praying that they would pull their starters and lose one of these last two games just so they would not have a chance at 19-0. So as a Patriots fan, this was the first time in my life I actually rooted for the Jets. I wrote a while back saying that Notre Dame should seriously consider joining a conference. I said it would make logical sense for them to join the Big 10. Well clearly the Big 10 powers that be are reading this blog and they are now talking about conference expansion. Jack Swarbrick came out earlier this week saying that ND would not be interested in such a move and that they enjoy their independence. Here is what I’m saying to Jack – it is time to realize that the college football landscape has changed and it is time for Notre Dame to change with it. The fact that this idea was shot down without even discussion just shows how behind the times the current ND administration is. Now a lot of “purists” will say that Notre Dame is different, it would go against what the place stands for, blah blah blah. Here is my response to that: Does Notre Dame want to have a big time college football program? If so, they need to change with the times. Notre Dame has always prided itself on its balance between education and athletics, which I truly admire. The fact remains though that their ideals have allowed them to fall behind other schools. 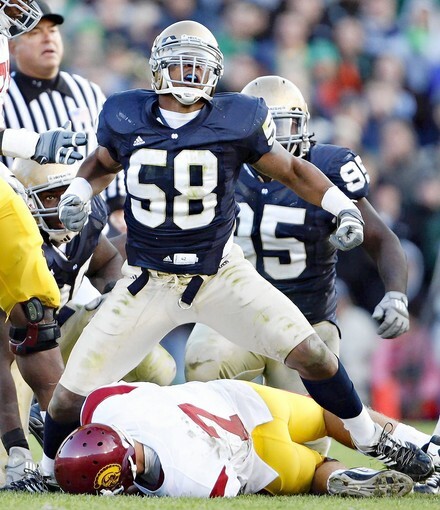 Did you know that Notre Dame is going to have a football training table for the first time in 2010? Texas has its own athlete dining hall. Every other D1 school (and some D2 schools) have training tables. Notre Dame doesn’t because they want the athletes to be a part of the regular student body. That puts its football players, the ones that generate a lot of money for the school at a major disadvantage. Anyways, back to joining the Big 10. There would obviously have to be a lot of negotiating to make this happen – scheduling, TV contract, division alignment, revenue sharing, etc. The fact remains though that pretty much the only championship that Notre Dame plays for is the National Championship. Not that they have competed for it at all recently but they have nothing to fall back on. All other schools play for a conference championship and by winning that, a trip to the BCS. I know the purists hate the idea of giving up independence and if Notre Dame continues its course, they will be happy. I just think it is time for ND to join the rest of college football in the present and at least consider the idea. I got nothing. I have been racking my brain for the last few days thinking about something to write about. Nothing here. Nothing notable. Notre Dame has a coach but no games. The Red Sox made some moves but still need offense. The Patriots better beat the Bills on Sunday. 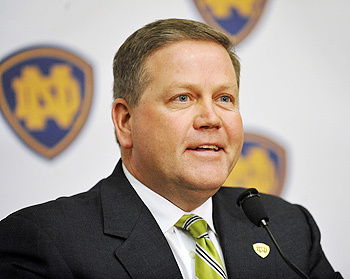 I probably should have blogged about this on Friday, after the official Brian Kelly press conference, but I have some thoughts on the first week of the Brian Kelly regime in South Bend. I love this statement – this is what Kelly has done his entire coaching career, figure out how to win with what you have. I have read a ton about Kelly – before and after his hiring. Former players say he was the toughest coach they have ever played for, obsessed with winning, almost a tyrant when it comes to conditioning his players in practice. This is exactly what Notre Dame football needs. They need a guy who can be a great face to the media and a win-at-all-costs dictator to his team. As positive as everything is with Kelly, I still have some concerns. Will he be able to handle to bright spotlight? Kelly has never dealt with public pressure like this in his coaching career. Will it tire him out? Will he bring in assistants that can handle working at a top program? Right now, I am hopeful. I think Jack Swarbrick made a great hire. No one will really know until probably next November. Weis had the ability to get his teams through September and October but his teams fell apart in November. Will Kelly train his teams to be tough, especially as games get more important in late November? We have no reason to think he can’t. I know I’m a little late on this but I want to comment on Adalius Thomas and the current baby-act he is playing with the Patriots. Everyone knows him and 3 other players were sent home last week for being late to practice. Thomas was the only one to go to the media and complain about it. 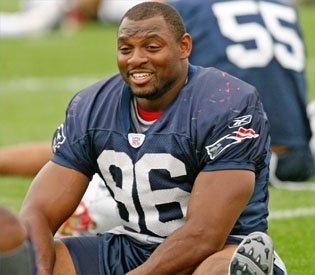 I will say this – I hope Adalius Thomas does not play another game in a Patriots uniform. You don’t cross the coach and get away with it. Not to mention, the guy has sucked 95% of the time while playing in the New England. He’s a punk on and off the field. He should be thanking Belichick everyday for signing him because he has basically been stealing money from Bob Kraft since he came on board. Get lost, loser. The New England Patriots don’t need punks like you. In news that surprised me, the Red Sox signed John Lackey and Mike Cameron yesterday. I didn’t even know that Lackey was even on the Sox radar and with his signing, it effectively ended Jason Bay’s chance of returning to the Sox. So we will now get to enjoy a Mike Cameron/Jeremy Hermida platoon in left field next year. I am really excited about the pitching staff – Lester, Beckett, Lackey, Dice-K, and Buchholz is a great rotation, probably the best in baseball. I still have concerns about the offense though. I don’t have the stats but just using the eye-ball test, I felt the Red Sox big issue last year (and in 2008 too) was the inability to hit good pitching. If that is still the biggest problem with this team, these moves have done nothing to fix that. My hope is that there is another shoe to drop and the Sox will go out and make a deal for an impact bat at 1st or 3rd.